The act of annulment characterizes the entire path of spiritual evolution. At each stage, the creature cancels its desire created as existence from absence and uses it to become equivalent to the Creator. In the beginning, it nullifies itself as a point in order to obtain an enormous need. What for? It’s in order to have a Kli (vessel) adequate to the Creator. At the second stage, it cancels this need and rises above it. 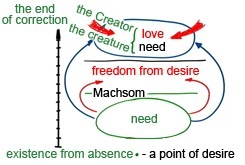 Renouncement of the desire signifies crossing over the Machsom (the barrier separating us from spirituality). Having ascended, the creature breaks free from desire, and consequently transitions to the next stage. There, the created being renews the desire and even starts receiving pleasure in it not for self-gratification, but in order to delight the Creator who loves it, thereby demonstrating its love to Him. In other words, during its entire ascent on the rungs of the ladder leading to Gmar Tikkun (the end of correction), the creature renounces itself. It turns out that self-annulment is a means, act, and outcome all at the same time. With its help we advance on the ladder of values until we reach the ultimate value when self-annulment reaches such a high degree that it results in becoming equivalent to the Creator. Paradoxically, it is through the act of renouncement, when I nullify my point of existence from absence, that I reach the status of the Creator. Using it as a foundation, I constantly grow, affected by the Light’s impact on it. In our corporeal life, we don’t feel the Creator, nor do we perceive spiritual forces or understand the purpose of creation. Before whom, then, can we nullify ourselves? I nullify myself before the group, meaning the teacher, Kabbalistic texts, and people who aspire to the same purpose as I do. I cancel myself in relation to them, not in relation to the desires of this world that are not connected with spiritual development. I dissolve in the group as if I don’t exist. I keep only the second part (Ain, absence) of my point of “existence from absence” (Yesh mi Ain) and copy their thoughts and feelings, disregarding my own. By doing so, I enter the spiritual system and start receiving the Surrounding Lights that promote me to the spiritual world.